Find out what the standard tuition charge is for U.S. students throughout the country, and how Bryant and Stratton College - Eastlake stacks up. Plan economically for your degree. Compare Bryant and Stratton College - Eastlake's fees and tuition to other American colleges and universities. Check for price tendencies and potential increases to find out whether you have to allocate more funds for the next 4-6 years of paying for college. The subsequent table outlines how Bryant and Stratton College - Eastlake measures up to other schools nationally, regionally and by state. 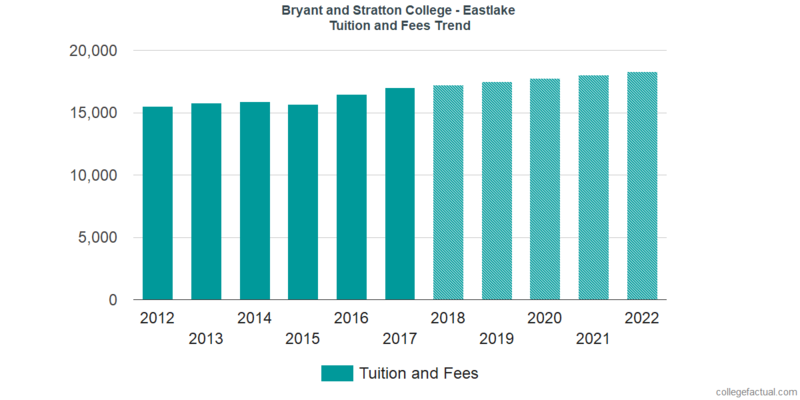 How Much Will Tuition & Fees Be for Bryant and Stratton College - Eastlake? In the 2017 - 2018 school year, full time students at Bryant and Stratton College - Eastlake were billed $16,980, prior to modifications for financial need. From this total, the cost of tuition was $16,482. The remaining $498 represents additional fees. Alas, this school does not provide any discounts to in-state students. Fees and tuition prices quoted here do not include room and board, which will drive up your costs. Having said that, most students will end up spending less than full tuition after getting financial aid along with other reductions. How much does Bryant and Stratton College - Eastlake cost per credit hour? For more information, check out Bryant and Stratton College - Eastlake Part Time Tuition & Fees. There has been a rise of 1.5% in Bryant and Stratton College - Eastlake fees and tuition for out-of-state students in the past 5 years. Tuition increased by 1.2% and fees increased by -0.6%. This year, undergraduates should anticipate paying $17,236 if the growth keeps up. Because of price increases, the full cost of a four-year degree will be $70,523, and the full price of a two-year degree would be $34,733, not including additional expenses for books, transportation, and room and board. See this next chart to see how Bryant and Stratton College - Eastlake fees and tuition may grow in the future. At most schools you'll end up paying out more for your last year of college than you will in your first. This is because of annual price increases. It's good to keep yourself updated! Uncover answers to your financial concerns in the tuition & fees FAQ.